New to Holy Priest? Just rolled an alt or returned for BFA? This quick guide has everything you need to know to hit the ground running without all the complicated fluff. Click the tabs below to take a look at some brief guides for leveling, raiding, and mythic+! We highly suggest you do not quest as Holy. It is quite inefficient compared to the other 2 specs available, even in a group! Instead, if you want to quest check out the Shadow or Discipline Quickstart sections on leveling and fire up your off-spec. If you really want to level as holy, you can follow most of the setup shown to you in the Dungeon Healing tab. It discusses the best way to DPS given the tools that we have. Gearing will also be very similar, you will want to use the highest item level gear you can get. You’ll be replacing it very quickly so there is no need to really min-max any of it. Legendaries can be used for the first half of your leveling experience: Use Sephuz’s Secret and Muze’s Unwavering Will to aid with your DPS. Again we don’t suggest leveling purely in dungeons as it will be quite slow, plus you should be questing in the zones for the rep you will need at 120 anyway! However if you do end up doing the odd dungeon and want to heal, go nuts – we’re amazing for that obviously. Just use the advice on the Dungeon Healing tab and you’ll do just fine. Because Intellect is our best stat by a significant margin you should equip your HIGHEST ITEM LEVEL GEAR. Your weapon enchant should be Coastal Surge or Masterful Navigation. Your ring enchants should be Pact of Mastery. Due to most of our Azerite traits being so similar in value, it isn’t overly important which Azerite armor items you end up using. The important thing is to pick the appropriate traits for healing as a Holy Priest. For more information on the following table, or if you want to compare your trinkets, visit our spreadsheet. The crafted trinkets are quite poor compared to their higher item-level cousins so avoid those unless you have extremely bad luck with other trinket sources. Enlightenment is the go-to for most raiding scenarios. Trail of Light could be useful on some fights where few people are taking damage consistently. Angelic Feather gives a 5-second sprint with 3 charges. A macro to cast it at your feet can be found here. Heals 5 allies whenever one of your holy words comes off CD for free! All 3 of these talents can have their uses in raiding, which will depend on the encounter. Circle of Healing becomes another spell you hit as often as possible. All three talents can be used here. Divine Star can be great for fights where the raid is stacked. Halo is great for burst healing at a specific time, but is not so great for fights where you don’t want to damage mobs (think breaking CC). Awesome cooldown that combines a burst heal with HoTs. Here are the spells you should use and when you should use ’em! Holy Word: Sanctify / Holy Word: Serenity – Use often. Use them on cooldown as long as they can do their job without much overhealing. If there’s raid-wide damage to heal, use it! Circle of Healing – Use often. Can be cast on the move and does great healing. Prayer of Mending – Use always. Make sure you cast it on somebody who will be taking damage. Prayer of Healing – During AoE damage. Prayer of Healing is our go-to AoE filler spell. Flash Heal / Heal– During ST damage. Use Flash Heal if it is an emergency and that player needs healing NOW. Heal should be used as your single target filler. Our least efficient spell, and should only be cast while moving and if no other instant cast spells are up. Big raid cooldowns are usually planned before the encounter, but if it’s not, use it during high damage moments, early and often! Salvation’s CD depends on how much you cast your holy words. Consider it a 4-6 minute CD. It will save your target from death as long as they don’t take damage worth more than twice their max health. Our personal cooldown. Not great but not awful either. This is a channeled cast, so plan it carefully. Because it restores missing mana you get more out of it if you cast it late into the fight. So what’s the big secret to awesome HPS?! 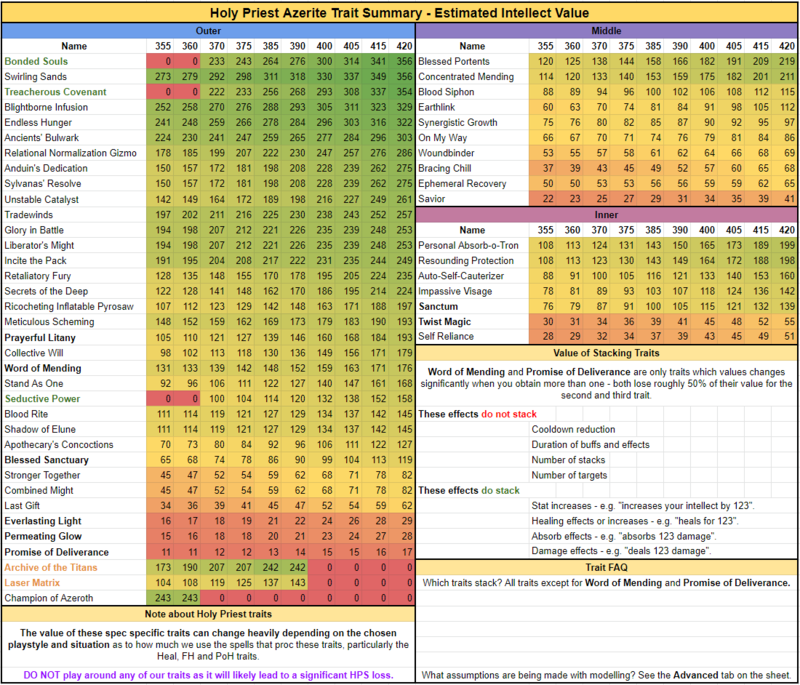 Holy Priests don’t have many instant casts, so learning the encounters and in particular, your guilds specific strategy is one of the best ways to increase your HPS. Reducing your movement during a fight and understanding when to use your stronger healing abilities is key to doing the most effective healing possible. 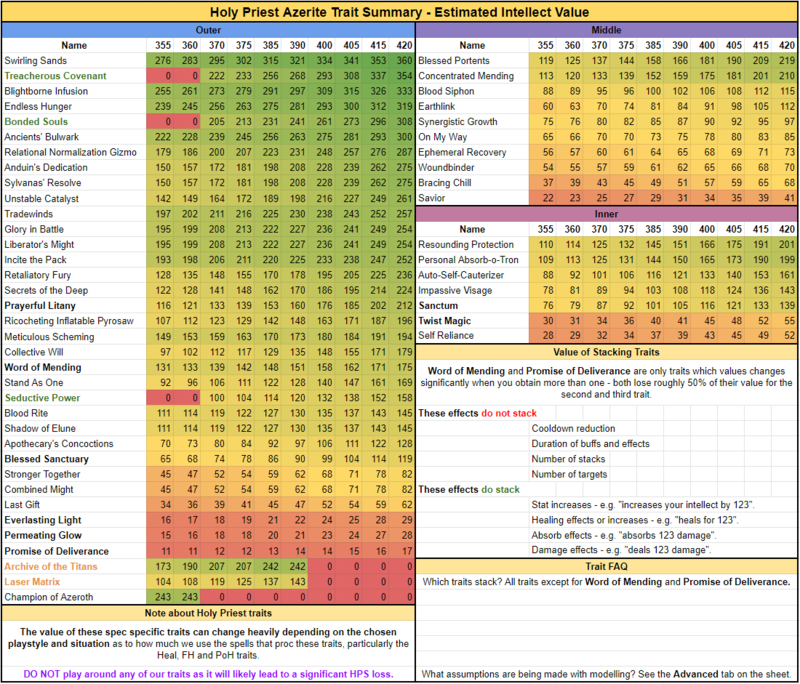 Try to pay attention to boss mechanics to make the most of your Holy Word: Sanctify and Prayer of Healing casts in particular, while also keeping Prayer of Mending on cooldown as much as possible. Your weapon enchant should be Deadly Navigation. Your ring enchants should be Pact of Critical Strike. Due to most of our Azerite traits being so similar in value, it isn’t overly important which Azerite armor items you end up using. Most of the healing trinkets from Dungeons, World Bosses and World Quests are all looking very even in value currently. This will help you when there is heavier damage to multiple people. Our one and only movement ability! A macro to cast it at your feet can be found here. This will be helpful when your allies (especially tanks) are taking a lot of damage. All of these talents have different uses. Need to stun one mob? Censure. Knockback? Shining Force. CC a bunch of mobs often? Psychic Voice. Circle of Healing is a great instant cast heal to the entire party. Divine star is the safest option on this tier and can instantly provide extra damage and healing. Halo can also be used, though some have issues when it comes to pulling extra mobs. Make sure to plan appropriately! This talent is great for when you need the extra healing, damage, or crowd control. But what buttons do I push?! Use them on CD as long as they can do their job without much overhealing. A lot of your healing in a dungeon is single target healing, and Flash Heal is our go-to for that. Divine Star – Use always. Use Divine Star for both healing and damage. Prayer of Mending – Use often. This should not take priority over direct heals during heavy damage, but is still good to cast during downtime. Prayer of Healing – For AoE damage. Use this when there is group-wide damage. Renew – For movement and light damage. With mana not being an issue, using Renew is great for smoothing over light damage, especially with the movement between pulls. DPS – During downtime/light damage. Don’t be afraid to deal damage in your downtime! Smite is a great filler, and will also reduce your Chastise cooldown. Holy Fire is great to use, especially on the move! Use Holy Nova for spammable AoE. Great to help you getting breathing room during pulls that are strenuous. It is sometimes more helpful to use Divine Hymn just for the healing increase, as sometimes it heals too slowly for the damage that is coming in. This will save your target from death as long as they don’t take damage worth more than twice their max health. You can use this for the extra HP it gives when you are low, or you can use it preemptively to give yourself more health before large damage spikes. This talent should be used as often as possible for both HPS and DPS. SO HOW CAN I KEEP THESE CRAZY DPS ALIVE? Be preemptive! Make sure to keep yourself ahead of the group, be ready to drink in between pulls, and help out with CC when the time comes. Good placement will make everything so much easier for you. Using your holy words for big damage and keeping everyone topped off will help make the run go smoothly. DPS in your downtime to help kill things faster!